Approximately 1.98ha in size with 75.3 metres of frontage on Tecumseth Street, the site has a further 7.3 metres of frontage on Wellington Street West, and approximately 25 metres of frontage on Niagara Street created through the incorporation of 125 Niagara Street into the overall development proposal. The site was formerly home to part of the Garrison Creek waterway, having since been forced underground and buried from the public realm since the late 1800s. At the very core of the Proposed Development is the notion of paying respect to and honouring this former waterway through the overall site organization and design language proposed. Starting with a high-level design approach to the site organization, the site has been broken down into three distinct typological areas following the historical Garrison Creek banks. These areas are referred to as the Lowlands, the Creek Bank, and the Plateau. The Creek Bank area forms the physical and typological divide between the Lowlands and the Plateau areas and generally follows the former Garrison Creek banks. These areas, the Lowlands and the Plateau are vertically separated approximately 3.0 metres further reinforcing the distinct character of the each of the two areas. 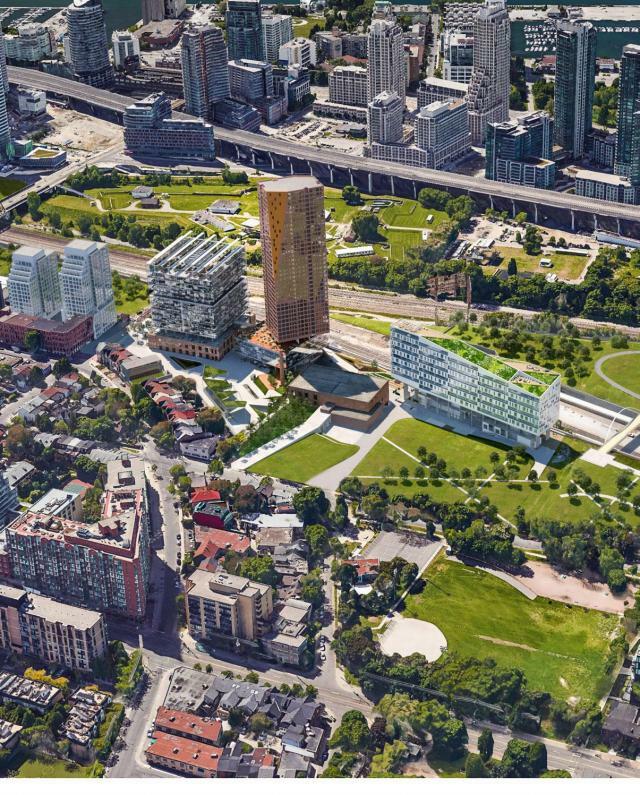 The Plateau area will house buildings 1, 2, 4 and 5 and accommodate the main passive recreation and open space area of the proposed development. The vertical separation between the Lowlands and Plateau areas allows for an expansive concourse level to be provided beneath the plateau surface, and accessed at-grade from the Lowlands area and below grade from buildings 1, 2 and 5. The proposed design and overall structure of the proposed development contemplates and provides for connectivity with any future development of the Wellington Destructor facility. Access from the surface of the plateau area is also provided by way of publicly accessible stair entrances. Building 1 is proposed to be an adaptve-reuse of the former abattoir structure to house market and retail uses at grade and second levels (5,616 sq.m.) with an 11-storey addition above housing a total of 23,047 sq.m. of office space. The roof level is proposed to accommodate a large greenhouse for urban agricultural (market gardening) uses including an urban apiary. Building 2 is proposed to be a 38-storey residental building straddling the Lowlands and Plateau areas along the Creek Bank. By straddling all three areas, pedestrian access can be provided at-grade from both the Plateau and the Lowlands, significantly increasing the functional permeability of the Proposed Development. Building 2 is proposed to accommodate a total of 27,391 sq.m. of residential GFA, 3,936 sq.m. of office GFA and 1,052 sq.m. of retail GFA. The proposed retail and office areas will be contained within a three-storey glazed podium, and will be connected above and below grade to Buildings 1 and 5 further facilitating pedestrian movement around the Subject Site in all seasons. Building 5 provides covered access to the below grade parking areas and concourse level along with accommodating 235 sq.m. of retail, and restaurant uses. Building 5 will feature an open-air roof section creating an open-air passive market space with interior and exterior urban space for neighbourhood residents and visitors alike. The Lowlands area is ‘sunken’ in relation to the Plateau area, with the Creek Bank area providing a sloping transitional area as pedestrians move between the two areas. Facilitating passive and active interaction with the pedestrian environment, a series of design elements are proposed at-grade along the lowlands, including a boardwalk amphitheatre, indigenous grass plantings and bleachers along the north side of the rail corridor for train-spotting. Two buildings are proposed within the lowlands; Building 3 a 15-storey mixed-use building containing 23,510 sq.m. of residential GFA and 1,404 sq.m. of retail GFA. Building 6 is proposed to be a 176 sq.m. kiosk building. Overall, the development proposes to create a true complete community where future residents and visitors alike will be able to live, raise their family, work, shop, play and age in place within a unique and high-quality pedestrian-oriented urban environment.